Peak climbed first from J.A.Carrel in 1865, it’s still one of the most desired routes from all the mountaineers. 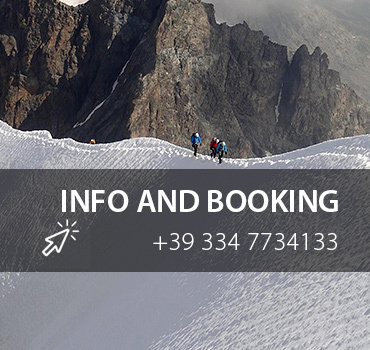 Following the footprints of the first climber, we go long a great ridge offering 360° landscapes on the surrounding Alps, reaching the prestigious peak of Matterhorn. The route starts from the Carrel Hut, where we spend the night before the climb, and requires to pass almost 700m in height in more or less 5 hours. Not to be underestimated the long and delicate descent from the top to Cervinia to be done in the second part of the day. Know also as the Italian normal route, gets the name of Leone ridge because the way, almost all on the edge of the ridge, connects the Colle di Leone with the Pic Tyndall to reach then the top of the Matterhorn 4478m. The way is a bit shorter than the Swiss normal route, on the Hörnli ridge,but is technically more demanding due to the frequent IV grade steps in high mountain to be climbed. This steps are equipped with fix ropes and rope ladders that facilitate the passing by, but they are strenuous any way. For security reasons and rules each Guide can accompany just one person. Not included in the fee: Hut's expenses, Guide's expenses and transfer, cable lift tikket and all not specified in "included". Equipment provided by Mountime: harness, helmet, ferrata set, ice axe and crampons. Personal equipment: Technical mountain sportswear,semi-crampon boots, gloves and cap, sun glasses and sun's cream, backpack with water and energetic food. (Let us know if you miss something, probabli we can help you).